Bostondotcom Theo's here to talk about the Sox and to promote Wednesday's Hot Stove, Cool Music concert at Fenway Park. This year's lineup features James Taylor, Howie Day, Ayla Brown, Mike O'Malley, Buffalo Tom, along with Theo, and all proceeds benefit his charity, Foundation to be Named Later. A limited amount of tickets remain - call 877-REDSOX9 or visit redsox.com. hog Theo, what's your favorite song off of Pearl Jam's latest album? And will the boys return the favor and join you on stage for a song?? Theo_Epstein My favorite one off the new album is Marker in the Sand. Unfortunately, Pearl Jam's schedule calls for them to be in California on Wednesday, so they won't be able to make it. But James Taylor will be in town. Sam Thanks for the 2004 Championship run and your overall bold vision for the organization. It's fascinating to me how some players raise their level of play once they get to Fenway (of recent example: Loretta, Lowell, Gonzalez). Wondering if someone like Kyle Snyder can do the same. I realize his past performance has not been stellar. However, are there any indications that he could be a player who thrives on the Fenway stage? Theo_Epstein Kyle was pleased to join the Red Sox organization and sees it as a breath of fresh air after being with one organization his entire career. He enjoyed his debut at Fenway and is continuing his development at Triple-A. There's a good chance we'll see him at some point before the end of the year. We were all impressed by him both on and off the field. Chappy In a perfect world, what would you like to add to the team prior to the trading deadline? Theo_Epstein In a perfect world, we'd add an impact starting pitcher, but I think 29 teams would have the same answer. This year's trade market looks to be similar to last year in that there is more demand than supply for quality players. We will be aggressive, but will not mortgage our future for a short-term fix. Tornadoesfan Do you thing that The Red Sox would have won the World Series in 2004 without David Ortiz? Theo_Epstein That's an easy question ... I don't think we would have. You could say we probably wouldn't have won that World Series without any of the 25 guys because everyone contributed. Obviously, none more so than David. He continues to amaze us. bilcha Theo right now you have Papelbon, Youks, Manny D., Hansen, etc. up and helping in a big way, whom do you see as the next 3-4 minor league guys having a significant impact on the team in the next few years? Theo_Epstein We have several players in the upper minors who should be ready to contribute soon. Dustin Pedroia and David Murphy are our top position prospects in Triple-A. Among starting pitchers, David Pauley, Abe Alvarez, and Kason Gabbard are closest to helping. Edgar Martinez is also doing a nice job in Portland's bullpen. gusterfan Theo ... how long do you think you'll be on stage on Wednesday at Fenway? How many songs? Theo_Epstein Buffalo Tom and I are scheduled for about a half and hour, which is probably five songs or so. CursedNoMore Theo, I'm concerned that the starting pitching is not effective enough to win two playoff series against top-notch A.L. teams, as is. Is there any chance whatsoever that a trade might facilitate Jonathan Papelbon's move to the top of the rotation? Theo_Epstein While we all think that Papelbon could be an effective starter, the rule that governs this decision is "Don't mess with success." I don't know where we'd be without him in the closer's role. dominican_soxfan I have two questions in one. First of all, I thought you all had an excellent strategy for the draft and the Red Sox ended up with what appears to be a very nice draft board. My question is how are the signings of Bard, Cox, Belt, and Anderson coming along, are the Sox done with international signings after the great pick-ups of Beltre and Tejada, and are the two related? Theo_Epstein Cox is signed and will make his debut soon. The other signings are moving along. We'll continue to be aggressive internationally if the right opportunity comes along. Beltre and Tejada are not related to their big-league namesakes, nor to each other. LASo Hey Theo. What did you think of the receptions that Damon and Pedro received at Fenway? Theo_Epstein I always think the appropriate response for a returning player is to be applauded for his contribution the first time he is announced. After that, the Red Sox come first. Obviously, fans have a right to cheer or boo whoever they like. Silvafish Theo: With the trade deadline approaching, how soon do you need to make a decision on whether or not Wells and Clement can help this year? Theo_Epstein I think we have to take the best medical information we have and make an educated guess. BarnstableMike Relief pitchers seem like some of the most difficult commodities to evaluate in Baseball. What sorts of things can you do to account for the small sample sizes involved, with respect to both signing free agents as well as evaluating current players? Theo_Epstein It's important to get as many looks as possible on relievers, because their stuff can come and go. Generally, we feel the best way to deal with this problem is to develop our own relief pitchers through the minor league system. apex12 Theo- First off you are my idol and a lot of people look up to you. Question: What is the best advice you can give for breaking into the baseball business? Theo_Epstein The best advice is to get as much experience as early as possible. If you're in school, try to work in the sports information department or volunteer to help the baseball team. If you're not in school, attend as many minor league games as possible and chat with scouts behind home plate. Try to get a feel for evaluating players and this will help you have knowledgeable conversations when you get an interview. jimbo_2 Any updates on our friend Peter Gammons? Theo_Epstein The doctors are very happy about Peter's progress even as they warn that a long road lies ahead. Our thoughts and best wishes go to Peter and his family. It's not the same around Fenway Park without him. napes Do you think Clemens was ever genuinely interested in going to a team other than the Astros? Theo_Epstein I think he was genuinely interested in the Red Sox. His decision came down to the last minute. beatle Are we in for any surprises at the concert? Theo_Epstein There are always surprises at Hot Stove, Cool Music ... you'll have to stay tuned. J-Lexx Other than a fifth pitcher in the rotation, the team seems fairly complete. Are there any other areas that you would like to try to address that you see as weaknesses? What about batters who can handle left-handed pitching? Is that an area of concern? Theo_Epstein I'm pretty confident that we'll fare better against lefthanders in the second half than we did in the first half. When preparing for the stretch run, the bullpen and the bench take on added importance. Money_Baller There is a chapter in Money Ball where they highlight Chad Bradford and describe underhanders as the best value in baseball. Is this why every underhander in the game (from Saurbeck to Bradford to Kim to Myers to the new guy) has had a stint in Boston? Green_Monster Is finding a fifth starter from within the organization an option? Id hate to see some of these terrific young prospects traded away for a rental. Theo_Epstein We're never shy about giving opportunities to players inside the organization. We'll continue to explore our options both internally and externally. Theo_Epstein There is a Hot Stove, Cool Music CD available at local record stores. There may be another one in the works. VegasSoxFan Theo, Thanks for taking the time to chat. I'm wondering about promotions down on the farm. Players like Bowden, Buchholz, Wagner, Ellsbury, Hottovy, E-Mart, and Spann have had strong first halves of the season. Will any of these players be promoted soon? And, if you don't believe it is appropriate to comment on individual players, could you describe the promotion calculus employed by the org? Theo_Epstein Some of those players will be promoted before the end of the season. Every player in the organization has an individual player development plan in writing, with individual development goals that must be achieved before promotion. As tempting as it is to promote players on numbers alone, we try to make sure that their weaknesses have been improved before they move on. rjk_2 From what I've read, you are a very focused person and find the local aggressive media to be distracting (as so many of the players). Since returning, have you been able to manage that better and are you happy with how things are going this year? Theo_Epstein Everything has been running very smoothly this season. The media is part of our environment and it's important for us to find an effective way to deal with them. warmmdaddy when rosters expand, who would you like to see come up and of the call ups, who might make surprisingly impactful contributions during the stretch run? Theo_Epstein It wouldn't be appropriate for me to get into specific names, but I think we have a lot of appealing options at Triple-A. Unfortunately, we can't call up everyone who is deserving. Dim With Youkilis basically the only 1B on the roster, how long before we see a guy like Choi on the team? Or is the team really serious about having Wily Mo Pena play 1B? Theo_Epstein We've made it work so far without an extra corner guy. Pena played a few games at first base in Pawtucket and will be available if the situation arises. jk_2 With being a general manager of a major league team, your music and charity work, do you ever sleep? Dan_Budreika Theo- Do you miss Josh Brynes and Peter Woodfork, who are now in AZ? Theo_Epstein Is this Josh or Peter who submitted the question? Seriously, we miss both guys and wish them the best in Arizona. Soxfan81 Theo, what do you see in your future, maybe 10 or 15 years from now when you may have moved on from being a GM? Theo_Epstein I have no idea ... but I hope wherever I am I have more than one ring on my finger. DirtDog7 Hey Theo, I was just wondering what your thoughts were on the team chemistry for this year's team. People in Boston have always given great importance to having a team with an identity and I know that a few people were worried that there would be 0% clubhouse cohesion with so many new guys playing regularly and the departure of people like Millar and Arroyo and his guitar. What are your thoughts on the identity, or lack thereof, with this year's group? Theo_Epstein I wouldn't be so worried. When you have a clubhouse full of character guys who are good teammates, chemistry develops by the end of spring training. I like the makeup of this clubhouse quite a bit. Green_Monster Theo- Are you at all surprised at the emergence defensively and offensively of Kevin Youkilis? Theo_Epstein We knew Youkilis would eventually be a player of this caliber, but we thought it might have taken him a little longer to adjust to playing first base. MTL How is Dustin Pedroia doing on the farm? Do you foresee him on the major league roster next year? Theo_Epstein After overcoming a shoulder injury in spring training and a slow start, Pedroia is having a fantastic year. He is a big part of our future. skumar3 How is Schilling's elbow? Theo_Epstein It's swollen, but we hope he'll be able to make his next start on Saturday. bosoxxx Hey Theo! When contemplating a trade, when do you determine the price to be too high, and what will you be willing to give away to get another starting pitcher? 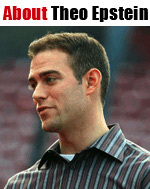 Theo_Epstein In our opinion, the price is too high when a trade hurts us more than it helps us going forward. With acquiring a starting pitcher or anyone else, we have to balance our short term and long term interests appropriately. RedSoxFanCT Down the stretch, do you anticipate the Blue Jays giving us more fits than the Yankees as the team strives for the AL East crown. Theo_Epstein I think both teams have enough talent to be in it until the end ... and so do we. pjm Do you think Craig Hansen will be closing games sometime next year? Theo_Epstein Craig Hansen already has raw, dominant stuff, and will continue to get better as he gains experience. At some point during Craig's career, he will have the opportunity to close. Theo_Epstein The MRI showed no structural damage, and we hope that this rest during the All-Star break will serve him well. sonarman217 Theo, what are the future plans for Edgar Martinez? Theo_Epstein Edgar is having a good season at Portland, as he continues to refine his slider and changeup. He is a promising prospect and with continued development should one day help the big league team. Theo_Epstein Thanks for all of your questions ... tickets to the concert are going fast. I hope that everyone goes to redsox.com today (or click the link on the left of the screen) or calls the ticket office (877-REDSOX-9)when it reopens tomorrow. We promise it will be one of the best nights of the summer. Hope to see you there! When hes not busy assembling a championship-contending team, Sox GM Theo Epstein coordinates the upcoming Hot Stove, Cool Music concert, which will take place on Wednesday, July 12 at 6 p.m. at Fenway Park. All proceeds will benefit Epstein's Foundation to Be Named Later, a branch of the Red Sox Foundation. Tickets to the concert can be purchased by clicking here or calling 877-REDSOX9.